Previously when uploading files to Google Drive, they would be sent to a folder called Uploads, instead of a destination folder. Now, when uploading files, you’ll see them appear within the destination folder to which you uploaded the file, along with a clear upload progress indicator. 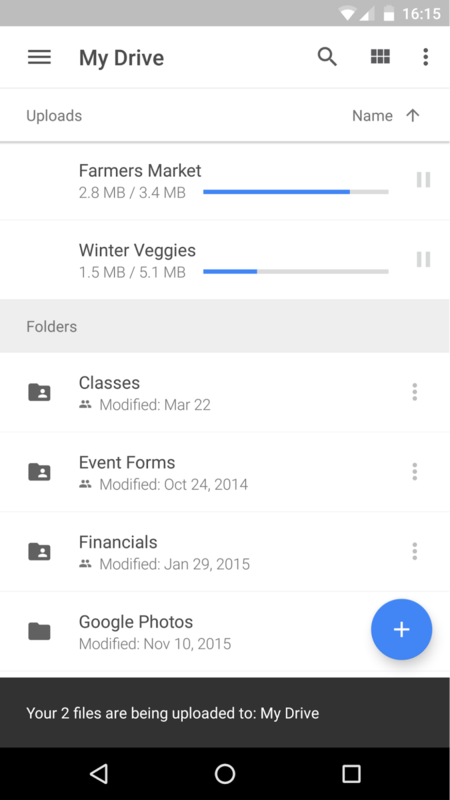 Inline Uploads: Previously when uploading files to Google Drive, they would be sent to a folder called Uploads, instead of a destination folder. Now, when uploading files, you’ll see them appear within the destination folder to which you uploaded the file, along with a clear upload progress indicator.